Once you have experienced a Cabo fishing trip, you won't care about the one that got away. Your Cabo fishing trip will be a pleasure no matter how you look at it. The temperate waters of the Sea of Cortez merge with the colder Pacific currents to create a rich, deep sea feeding ground and the Cabo Fishing Fleet offers some of the world's best Cabo fishing trips for striped marlin, bonitos, grouper, jack crevalle, mahi-mahi, dorado, shark, tuna, sail fish and much, much more. The expert crews of the Cabo Fishing Fleet will take you to where Cabo fishing is at its best on a flotilla of some of the finest, state of the art fishing boats available. Whether you prefer deep-sea fishing, light tackle fishing or fly fishing, the staff of the Cabo Fishing Fleet will ensure that your Cabo fishing trip is a success. There is nothing as exciting as wrestling that huge, striped marlin from the waters off the Baja Peninsula. The offshore boat charter is over before you know it, providing every comfort imaginable and expert advice for the novice and seasoned fisherman alike. 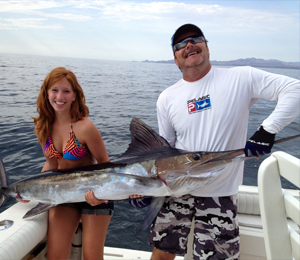 The range of Cabo fishing trips available makes it possible for all skill levels and budgets. You can get to that perfect Cabo fishing spot on anything from a 24-foot sport boat, stocked with all the basics, to a 70-foot luxury boat with all the amenities. Regardless of the size of the boat, you are sure to be well cared for on your offshore charter by tournament winning guides who have been leading Cabo fishing trips for generations. For your convenience, most Cabo fishing trips include all the tournament quality equipment you will need, plus food and beverages. Just be sure to use some heavy-duty line because the fish in Cabo are huge! Most guides recommend using 50-80# line. Also, you will need a Cabo fishing license for anglers over the age of 12. Your light tackle Cabo fishing charter will take you to the leading Cabo fishing spots with the best in gear and guidance you can find. Even if you have never fished a day in your life, you will enjoy the beautiful surroundings as you coax, cajole, capture and conquer the sport fish of your dreams. You can reel in a prize-winning monster to mount on your wall, or you can catch and release to your heart's content. If the paradise of Cabo San Lucas weren't vacation enough, with palm trees, white sand beaches and tropical beverages, your Cabo fishing trip may well be the best experience of your life. Fly Fishing in Cabo San Lucas is unmatched with coral reefs, shipwrecks and rocky shores providing a great habitat for many varieties of game fish. Saltwater fly-fishing is a great way for the novice fisherman to test the waters and learn the rhythm of fly-fishing under the expert guidance of Cabo Fishing Fleet guides. Experienced fishermen the world over agree that Cabo fishing is some of the most rewarding to be found, with an abundance of cubera snapper, rooster fish, jack crevalle, cerro mackerel, ready to be coaxed to the surface with a variety of lures. The open deck boats of the Cabo Fishing Fleet provide easy access to every good fishing spot. There is nothing better than a Cabo fishing trip, complete with high performance boats, secluded locations and some of the best guides and gear available. Fully certified and insured, Cabo Fishing Fleet guides have been featured on ESPN, the Sportsman Channel and OLN, as well as in Sport Fishing Magazine, guaranteeing you a successful Cabo fishing trip. Many travelers who enjoy their Cabo fishing trip also enjoy scuba diving in Key West with a quick trip to the Dry Tortugas National Park, or perhaps even a Bahamas dolphin encounter. Whatever your tropical getaway, you're sure to create memories that will last a lifetime.